Baseballtown will turn into a winter wonderland this holiday season when the Fightins and Savage 61 Chrysler Dodge Jeep Ram host Christmas at FirstEnergy Stadium presented by RAM Trucks, the team announced at Saturday’s game. The event will run nightly from Saturday, November 24th through Saturday, December 23rd from 5:00 p.m. to 9:00 p.m. during weekdays and 5:00 p.m. to 10:00 p.m. on Friday and Saturday. 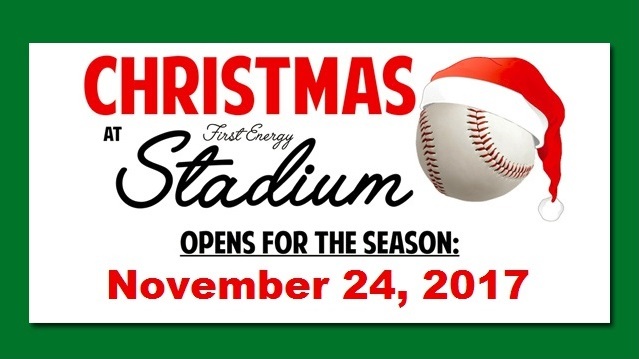 Christmas at FirstEnergy Stadium will be closed on Mondays. Fans will be able to capture the spirit of the holiday season as they stroll through the confines of FirstEnergy Stadium and visit different themed areas featuring sparkling holiday lights and glowing displays. Each night will feature a state of the art, multi-media field light show every hour at the top and bottom of every hour that will leave everyone in the family entertained. No trip to Christmas at FirstEnergy Stadium will be complete without a visit to see Santa. Old Saint Nick will be on hand to hear Christmas wishes from those on both the naughty and nice list each night. Rumor has it he may even be traveling with his 4 legged friends all the way from the North Pole. Santa Claus will also be recording personalized greetings each night for the good boys and girls in your family that will air on FirstEnergy Vision on the videoboard.